Our main priority is the safety of students and staff. All rules and procedures are designed with this goal in mind, so please help us keep everyone safe, happy, and ready to learn by using patience and consistency during arrival and dismissal! 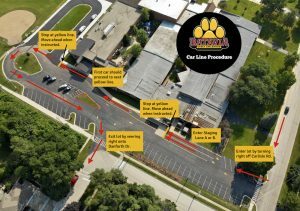 All families that drive to school are expected to use the drop-off/pick up zone and procedures for arrival and dismissal. Please refer to the traffic map on opposite page for details of the traffic flow. Each family will be given 2 student identification tags that will correspond to your child’s backpack tag. Should a tag become lost throughout the school year, you must contact your child’s teacher to request a replacement. This tag must be placed on the rear view mirror during drop off and pick up using the car line. When dropping off or picking up students, please follow the traffic flow and all instructions of EC staff. You may only enter the parking lot heading west on Carlisle Road to ensure a right turn into the parking lot. Please exit the parking lot by going straight on Danforth to avoid traffic congestion on Carlisle Road. As shown on the map, you will be directed to fill in the loading zone; staging lane A, staging lane B, when arriving for drop off and pick up. All cars will be instructed when to move by an EC staff member during the designated arrival and dismissal times. Do not pull around any waiting cars for the safety of all students and staff members. Drop off time is 8:55-9:05 a.m. for morning classes and 12:35- 12:45 p.m. for afternoon classes. If you arrive after the drop off times, please park your car in the lot and walk your child into the building through the main office to sign them in tardy. Any car that parks in the lot must be park in a designated and lined parking space.